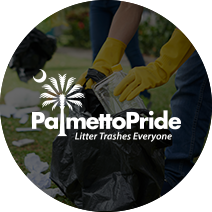 PalmettoPride is a non-profit organization that promotes a beautiful and litter-free South Carolina. Much more than a beautification effort, the multi-faceted organization is a true public/private partnership comprised of state agencies, concerned citizens, corporate sponsors, and community and civic organizations who all work together to raise awareness and educate communities about the full impact of littering. The organization runs numerous programs, seminars, and events throughout the year. For example, PalmettoPride oversees the popular Adopt-A-Highway program and the Keep South Carolina Beautiful initiative. Educational programs they sponsor include a SCDOE certified litter curriculum, the PalmettoPride Art Contest, and Litter-Free Games.The organization also works with the state legislature to revise litter laws and provides free courses for law enforcement and community leaders, teaching about the economic impact of littering, and preventing crime through environmental design. Clearly, PalmettoPride is a powerhouse organization that does a lot for our state. So, when they approached Kopis to help them update their Litter Busters Hotline, we were excited to help out. The LitterBusters Hotline is an awareness campaign that needed a simple, straightforward mobile solution. The goal of the Hotline is to encourage residents of South Carolina to take pride in their state by reporting litterers and trash hotspots. Residents can visit the website, call the 24/7 Hotline, or use the mobile app to report littering, unsecured loads, illegal dumping, and more. The Smart Government team at Kopis created a streamlined mobile solution for PalmettoPride that fully integrates with the automated system that the DMV uses to produce the courtesy letters. So far, the team that spearheaded the LitterBusters project at PalmettoPride has been pleased with the results. In addition to simplifying the look and feel of the LitterBusters mobile app, the Kopis team was able to use the technology to automate some of the internal processes at PalmettoPride, reducing the administrative burden for the busy organization. Finally, PalmettoPride has been impressed with the ROI that they’ve already experienced with the release of their new mobile app.